The Obama administration announced this month that the health insurance plans of religiously affiliated institutions must cover the cost of contraceptives without co-pay for their employees, and possibly for students as well. Under the new rule, set forth by the Affordable Care Act, most women employed in the U.S. will have the cost of their birth control covered with no co-pay. Churches and other places of worship would continue to be exempt from having to cover contraception for their employees if they morally object to the practice, according to Health and Human Services Secretary Kathleen Sebelius, but all other organizations will have a year to comply with the new requirement, regardless of whether or not they are religiously affiliated” (emphasis added). Of course, that wasn't enough for Archbishop Timothy Dolan, president of the extremely powerful U.S. Conference of Catholic Bishops, who called the decision "unconscionable." I sympathize. Sorta kinda. I don't believe the Catholic Church should have to pay for something it believes is wrong. (Of course, I don't think I should have to pay for unjust wars and corporate welfare either, but go figure.) At the same time, I don't believe that women who are employed by church-affiliated institutions should have to pay for contraception out of their own pockets. Neither should women employed by churches for that matter. In fact, the Catholic Church shouldn't be in the business of providing health insurance for any U.S. citizens. Ever. Rather, I believe that health care is a human right and that Medicare should be available to all of us, regardless of age, religious affiliation, or employment status. And I believe that women should be able to make their own choices about their reproductive health. Those who believe abortion is wrong shouldn't have one, and those who believe that contraception is wrong shouldn't use it. Everyone should have the freedom to choose according to their own conscience. Simple, right? It should be. Universal single-payer health care would solve the bishops’ problem, would it not? Religious institutions wouldn’t have to pay for their employees’ contraceptives. So why the hell aren't the good bishops lobbying for Medicare for all? Because that's not what the bishops really want. The bishops don't want to have to settle for just telling women what to do with their bodies; they want to control what women do with their bodies. And there's the real rub, isn't it? The bishops were not only influential in swaying votes during the health care reform debate; [Richard] Doerflinger said they actually helped Reps. Bart Stupak (D-Mich.) and Joe Pitts (R-Pa.) write the controversial anti-abortion amendment, which the House approved by a vote of 290 to 194. 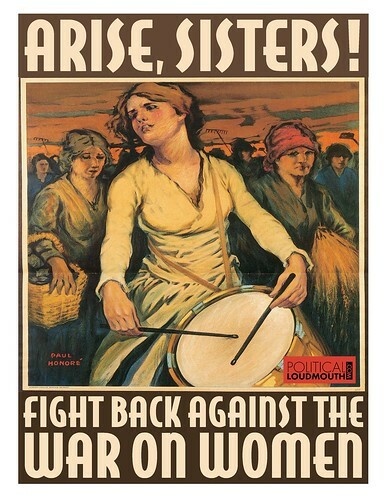 Thanks to Political Loudmouth for the great poster. Please, for God’s sake, get this straight: the United States is not a Catholic country. It’s not a Christian country. It’s a freedom-of-religion country. That doesn't mean that we’re an anti-religion country (God forbid!). It means that all of us have the right to practice our beliefs and religion—or our nonbeliefs and nonreligion—as we choose. It means that practitioners of one religion cannot impose their beliefs on the rest of us. That includes the good bishops. Most lobbyists on Capitol Hill have to pay for the privilege and power the bishops wield. Government by and for the monied interests is plenty bad enough and absolutely must be eradicated. But government by and for the Catholic Church, while it pays not a dime in taxes, so that it can control what women can and can't do with their own bodies—that's what I call unconscionable. Did you see this headline in the Washington Post last week? Former Rep. David Obey, who has said that he doesn't "really want to run"
State Sen. Tim Cullen, who in the infamous telephone conversation with Pseudo-Koch (Ian Murphy) was described by Walker as "the only reasonable one" among the Democrats in the state legislature. Not much of a recommendation if you ask me. Only one of the four have declared that they intend to run. If they have started putting together an organization and fund-raising, they've only just barely begun. Whereas Scooter, because of a "quirk in the state election law" that allows donors to contribute unlimited funds to a recall target, has been able to raise $4.5 million dollars in just five weeks. And, owing to the same "quirk," Scooter has to spend that money in a big ol' hurry. "In the same five weeks, the governor spent $4.9 million, a large chunk of it on TV and radio ads and direct mail solicitations. 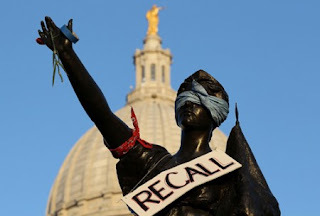 The unlimited funds must be spent before the recall is official." So it's not just one actual candidate against four hypotheticals. It's one stinkin' rich actual candidate against four hypotheticals. To his credit, Charles Franklin, the director of the poll, did admit that "the old line 'you don't beat somebody with nobody' is true." But hey, why not go ahead and poll anyway? 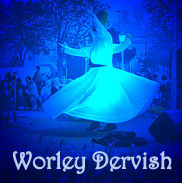 Just for jollies. Nobody's going to really take this thing seriously, are they? I figure the only polls Scooter and his handful of uber-rich supporters are going to feel good about for the foreseeable future are the ones like this one: completely make-believe. They're clinging to this fiction to avoid having to think about the stark reality of this number: 1,000,000. One million signatures to recall Scott Walker. That represents a total of 46 percent of the turnout in the 2010 race for governor and is very nearly the number of votes Walker got in that election. Here's another meaningful number: 30,000—as in that awesome "army of more than 30,000 Wisconsin born-and-bred recall volunteers" that United Wisconsin is so rightly proud of, as are we all. The army of 30,000 isn't done yet. Whoever Walker's challenger is will have that same highly motivated army ready to roll up their sleeves and put the "movement" into "grassroots." I keep telling you—we're only just getting going. Trust me on this. The really good stuff is yet to come. We know you have said repeatedly that you would not run for public office in 2012, and we have tried repeatedly to respect and honor that. But over and over again the idea comes sailing back, that the one person who would be best for Wisconsin in this exceptional historical moment, for so many reasons, is you. Photo courtesy of the Run, RUSS, Run Facebook page. Yesterday's decisive millionfold denunciation of the Fitzwalker regime underscores what a historic moment this is, not only in Wisconsin history, but in U.S. history. Recall elections in themselves are quite rare, and this may very well be the most extraordinary of all. There's no question but that this represents a singular opportunity for the people of Wisconsin. After having sustained so many wounds at the hands of the soon-to-be former regime, Wisconsin is in need of healing. There are a multitude of reasons why so many of us find ourselves looking to you, not to save us, but to lead us as we seek to clear up the rubble and reassert the values we hold most dear. We know you and we trust you. As our senator, you listened to us. You respected us. And you proved yourself to be an effective advocate for us. What we said and needed mattered to you. This is in stark contrast to the Fitzwalkers' refusal to listen to or care about the concerns of the people of Wisconsin. You have a proven record of bipartisan cooperation, as evidenced in the McCain-Feingold Campaign Finance Reform of 2002. The Fitzwalkers have been nothing if not divisive. But here in Wisconsin we have a tradition of listening to each other and working together, regardless of ideology and party affiliation, and we desperately need to return to that tradition of mutual respect and cooperation. It's truly a wonder that any sane, decent person would want to run for office in this country's current political climate, which resembles nothing so much as Hurricane Katrina in more ways than one. So really, we can understand why you'd want to be shut of it. But alas, your reticence to run is evidence of your sanity and decency and is, in fact, one of the best reasons why you are our first choice. Scott Walker is bad for Wisconsin in large part because of his overreaching power grabs. He is more of a despot than a governor. He listens only to the 1 percent (as evidenced by his scandalous public conversation with pseudo-Koch), and he treats the rest of us with utter disdain and contempt. And here you are, resisting the pursuit of political power. Nothing convinces us more thoroughly that you are the man of the moment. 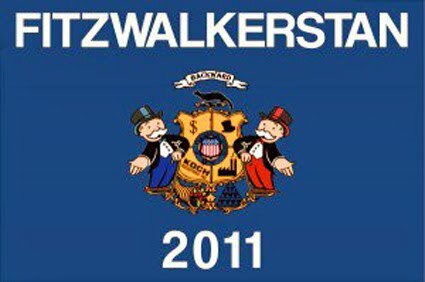 We know there are other good candidates that could run against Walker. But none of them would inspire us and energize us as much as you would. None would have our confidence or enthusiasm as much as you would. There's no one we would fight harder for or be prouder of. Maybe if this were an ordinary election in a less turbulent time, we would be satisfied with a good candidate and celebrate your new role as our fellow activist. But this is no ordinary time, and we need more than an ordinary candidate to run against Walker. Many of the other possibilities would be good. But you would be great. And that's what the people of Wisconsin long for and need in this critical moment. Please, please, let us sweep you into office and lead us as we begin a new era in Wisconsin history. Listen to us as you once did. In this one bright, shiny moment, the state of Fitzwalkerstan has been turned into the state of Euphoria. Can you feel the earth moving under your feet? This is a tectonic shift in American politics. I've never been prouder to be a Wisconsinite or an American. Today I can truly say that I am one in a million. Wisconsin, you are showing the world what democracy looks like. Yep. This is really big. And the best news of all? We're only just getting started. You ain't seen nothin' yet! 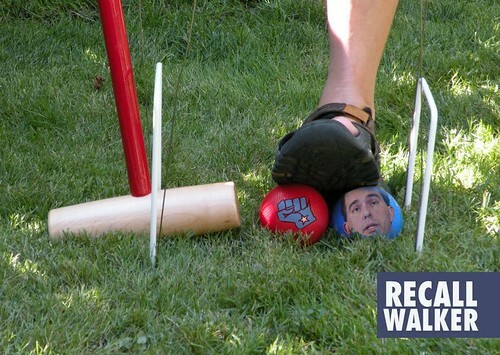 With less than a week to go in Wisconsin's effort to collect signatures for the Walker recall, many of us are understandably turning our thoughts to who will run against him in the upcoming election. Honestly, the first thought that has come to mind every time I've considered the question is Russ Feingold. 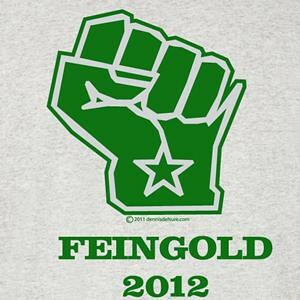 But Feingold has said repeatedly that he will not run for public office in 2012. And although I know that many politicians say one thing and mean another, I think Russ's resolve is quite firm in this respect. In a mid-December interview with Charles Benson of TMJ4 in Milwaukee, Feingold said he feels more a part of real change now than he did as a senator. Here's exactly what he said: "I feel more a part of real change now than I did even as a senator." Think about that for a minute. 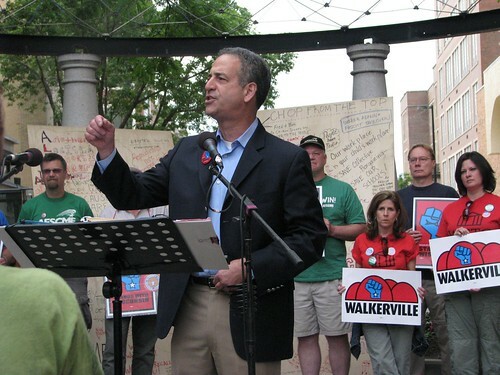 What Feingold is saying is that real change comes not so much from elected officials as from the people. You know—us. I'm not saying that it doesn't matter who runs against Walker. It does. And we do need to talk about that. But before we get going full tilt on that, we need to remind ourselves of something even more important: where real transformation comes from. Think about who you were, who we were, before Walker unleashed his draconian agenda on the people of Wisconsin last February. I didn't know the names of any state legislators but my own. I hardly ever spared a thought for state politics. Whenever there was an election, I did my best to catch up with the candidates and the issues. But it's not really possible to do that in just a few days. I was woefully out of touch. When I first learned about Walker's devastating "budget repair" bill, I firmly expected that people would be angry and would complain for a while and then continue going about their business as though nothing had happened. From seemingly out of nowhere, thousands of us—hundreds of thousands of us—gathered on the Capitol Square. Day. After. Day. We brought with us our signs, our outrage, our indignation, our sense of fairness, our determination, our sense of humor, our hats and mittens, and our friends, neighbors, kids, and grandparents. The people of Wisconsin woke up and rose up, and anyone who was there will never be the same again. We have sloughed off our complacency and have our sights firmly set on transforming our state into the beacon of progressive values it has long been and will be again. No politician, no candidate for governor, can do for Wisconsin what we can. It won't be enough to elect a progressive governor. It won't be enough to flip the state senate and the assembly. No matter how hard we have worked collecting signatures, no matter how hard we work on the recall election, it won't be enough if we don't continue doing the work of democracy. 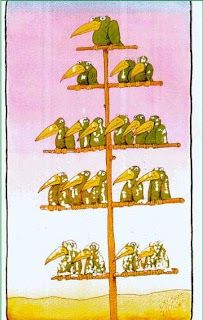 Me: So this explains why the "trickle-down economics," "government-is-the-problem," "deregulate-and-privatize-everything" ideas still have traction? Because they've been repeated loudly and vehemently and often enough? No wonder it seems like so much of public discourse has become a fact-free zone. Perhaps this touches on one of progressives' greatest difficulties. We like reasoned discussions; we like exchanging ideas of merit; we like refuting right-wing pundits' assertions. But when we do that, we often respond using the right's own language and ideas; we let them frame the discussion and we don't get to our own frames. Let's invite George Lakoff, author of Thinking Points: Communicating Our American Values and Vision, to join us. George: Progressives have a basic morality, which is largely unspoken. It has to be spoken, over and over, in every corner of our country. 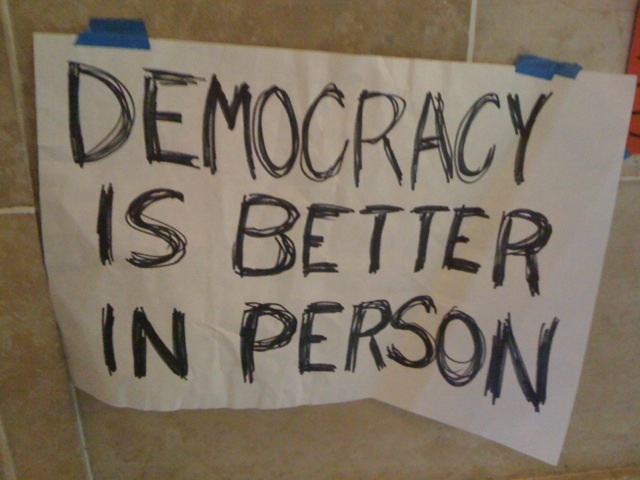 Progressives need to be both thinking and talking about their view of a moral democracy, about how a robust Public is necessary for private success, about all that the Public gives us, about the benefits of health, about a Market for All not a Greed Market, about regulation as protection, about revenue and investment, about corporations that keep wages low when profits are high, about how most of the rich earn a lot of their money without making anything or serving anyone, about how corporations govern your life for their profit not yours, about real food, about corporate and military waste, about the moral and social role of unions, about how global warming causes the increasingly monstrous effects of weather disasters, about how to save and preserve nature. Progressives have magnificent stories of their own to tell. They need to be telling them nonstop. Me: So in essence, this is what the right has been doing so effectively. They have hammered on their talking points until everyone is parroting them, not just the party faithful. Of course, it doesn't hurt that the right has its own 24/7 propaganda machine that happily reiterates right-wing frames over and over again. Still, you have to admit, they've been good at this stuff and progressives have not. 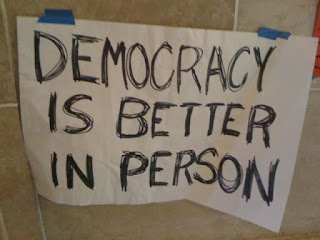 In the coming election year, beloveds, let's quit reacting to the right's provocations and focus like a laser on what we believe in: representative democracy, clean and transparent government, opportunity for all, the common good, the Bill of Rights, the well-being of the 99%, social as well as individual responsibility, inclusiveness and diversity, and compassion and empathy.